The story takes place in the fictional frontier town of Hallelujah, Oregon, and with the introduction of rail and steam, and references to the (Civil) War, the period seems to be close to the turn of the 20th century. I have lived in Oregon and still live nearby, so the setting has an appeal to me. The story follows Cedar Hunt, a tracker/bounty hunter cursed with Lycanthropy. When a little boy goes missing in town, Cedar decides to track the boy and bring him back. What Cedar doesn’t count on is crossing paths with the Strange, evil apparitions that stalk the land, and Shard Lefel, a railroad magnate with sinister plans of his own. Both Lefel and the Strange interfere with Cedar’s plans, causing him to sidetracked. To complicate matters, it’s a full moon, and Cedar has no control over who or what he kills when he takes his wolf form. Cedar Hunt is a troubled man. Due to his curse, he keeps his distance from other people. Many years ago he was responsible for the death of his brother, and it weighs heavily on him. He’s an honorable man, university-educated, and a likable character. Besides having viewpoints from Cedar Hunt and Shard Lefel, we are also following the stories of Mae Lindson and Rose Small. Mae is a witch, but one of the good types, she specializes in healing. Her husband has been killed by Shard Lefel, but unknown to her, her husband has risen to take revenge on Lefel. At the same time, Lefel needs the witch for his own dark purpose and plots to capture her. Rose Small is a teenager witch a knack for inventing things (called devising) and a desire to see the world. Left on the doorstep of her adopted parents’ home, no one knows exactly *what* Rose is, but it’s clear she’s troubled and mouthy, and because of that and her inventions, she is considered past her prime for marriage, leading to whispers about her throughout the town. There are also three brothers, miners called the Madder brothers, and an evil Strange known as Mr. Shunt, that feature prominently in the story. The paths of these characters constantly cross, and drive the story. At several points I expected the story to go a certain way, but Devon Monk surprised me by taking it in a different direction. There are all kinds of steampunk inventions, including mechanical creatures that serve as bodies for the Strange, powered by a green liquid called glim, which is harvested in the air by airships and is extremely valuable. The plot centers around two threads: cedar’s attempts to find the missing boy, and Lefel’s plan to return to his native land, for he is sort of a creature of faeirie. The plot works, for the most part, due to a time restriction for Lefel to return to his land, giving him a sense of urgency and desperation, while Cedar constantly comes up against powerful forces that get in his way as he searches for clues and tries to help the widowed Mae. Jeb Lindson keeps coming back from death, at least 3 or 4 times, with no real explanation for how this occurs, and becomes impossible to stop. By creating a character like this, it takes some of the drama out of the story, since you know the character can’t be stopped. People are constantly getting mortally wounded but still survive. It’s hard to tell what it takes to actually kill someone. At one point Mr. Shunt is destroyed but able to stitch himself back together; later in the story he is unable to accomplish this again, and I’m not sure why. There is also much mention of a gun needed to kill the Strange, but it never becomes the factor it’s made out to be, despite the fact that it’s mentioned constantly throughout the story. At one point characters are running through an underground mine but are found from above ground, without any explanations as to how they were able to be detected from above. With so many characters converging at the finale, things become a bit chaotic and the action can be hard to follow at times. Overall, it was an enjoyable read. Devon Monk has a prose that borders on beautiful, and there is a vibe, a feel to that prose, that is unique. It’s not for everybody; some reviewers over at Amazon have complained that the story moved too slowly, but I didn’t feel that way. It’s character-driven, meaning the characters are the focus, not the action. It does feel like this could be a screenplay – not for a movie, but rather a weekly series on, say, the Syfy channel, and it would be right at home next to Warehouse 13 or Haven. I think it would be quite good if done right. I wouldn’t claim it to be the best story I’ve read this year, but it was a good, light read, and I may spring for the sequel. 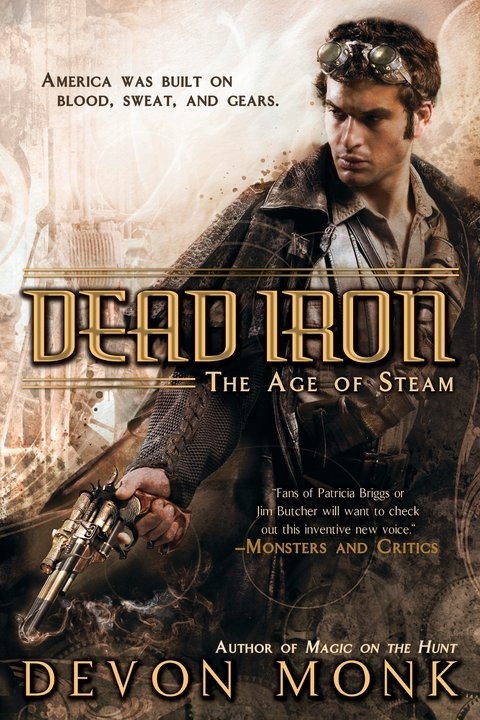 Posted on December 8, 2011 January 10, 2018 by hippogriffPosted in Book ReviewTagged age of steam, devon monk, Reviews, steampunk. Previous Previous post: Arkham Horror Books have arrived!